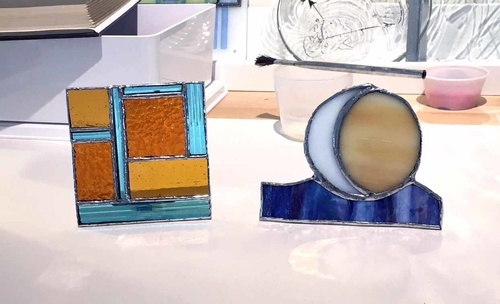 In this one day class, students will learn the basics of copper-foil stained glass techniques, popularized by Louis Comfort Tiffany in the early 20th century. Each student will design their own night light using techniques such as glass cutting, glass grinding, copper foil wrapping and soldering. Nightlights will be ready to take home the very same day. No prior experience necessary. To register, please email k.little57@gmail.com or visit us in person at the K. Little Glass studio on Artisans Row Wednesday through Monday 11am - 5pm (12-5 Sundays).